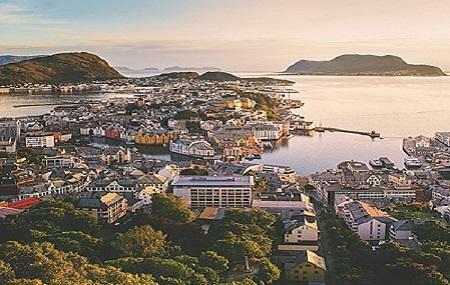 When you are in Ålesund, a chance to visit the Aksla Viewpoint should not be missed. You have to take 418 steps on the stairway from the center of the town, but the views that you get from top are absolutely worth the effort. The viewpoint offers stunning views of the town centre and the majestic range of Alps. The viewpoint has an outdoor restaurant and café. The facility also has clean toilets. Don’t forget to take your camera because the whole trail up to Aksla Viewpoint deserves to be captured in photographs, and taken home as a wonderful memory. How popular is Aksla Viewpoint? People normally also visit Alesund Town Park And Fjellstoua Viewpoint while planning their trip to Aksla Viewpoint. People also prefer to end their day with Aksla Viewpoint.